‘A new era in our existence’. 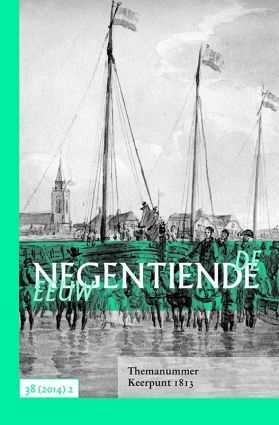 The memory of the Dutch Revolt and the temporal dimension of ‘1813’. The extent to which the memory of the sixteenth century Dutch revolt against Spain formed a framework for contemporaries of ‘1813’ to understand their own ‘revolution’ against Napoleon is the subject of this article. The author concludes that, on one hand, the memory of the revolt shaped contemporary interpretations of ‘1813’ in several ways. For instance, the nineteenth century narrative of the ‘national struggle for freedom against the foreign tyrant’ was framed on the memory of the earlier revolt. Also sixteenth century songs and texts were re-edited and adapted to fit the early nineteenth century context. On the other hand, authors of pamphlets and early histories of the events of 1813 pointed out the differences between ‘1572’ and ‘1813’ and emphasized the superiority of the more recent events over those of the sixteenth century. Paradoxically, by looking backward to the sixteenth century, contemporaries were able to conceive of ‘1813’ as a new beginning in national time. Long live the living past! The centenary of Dutch independence in 1913. This article deals with the relationship between commemorators and the commemorated past during the centenary of Dutch independence in 1913. At the historical procession in The Hague, which was the largest in the Netherlands, a linearly progressive narrative was presented, resulting in the glory of Oranje- Nassau and the fatherland. Both organizing committees and the audience expected that historical precision could lead to a proximity of the past, a ‘historical sensation’. This sensation was, however, anticipated and expected, showing that this performance could be perceived as an act of modern historical awareness. The impact of 1813 on early-nineteenth Dutch painting. Myth and facts. Painting in Holland around 1800 showed a remarkable revival of typical Dutch genres as landscape, seascape, still life, daily life scenes, etc. Shortly after the defeat of the French, prominent literators as Joan Melchior Kemper and the poet Marten Westerman framed this revival as the paradoxical result of an outburst of creativity unleashed by an oppressed sense of freedom. In this article their words are confronted with the attitude of the French occupier towards Dutch art. Can we speak of resistance painting, like we can of resistance poetry? The colours of Oranje. Reservations against the display of orange during the retreat of the French in the end of 1813. During the weeks of November 1813 there was an evident outburst of the Orangist repertoire, especially in the streets. The traditional view has been, that this was an expression of a natural and general wish for the return of the House of Orange. But the exhibition of orange in these weeks had different meanings and did provoke many objections. The regional elites not only feared reactions from the allies and the remaining French troops. In some regions, the elite did fear a return of the Ancien Régime and, above all, social and political unrest as a predictable follow-up of the outburst of popular orangism. In these weeks, the orange had still to become – and became end of November – a national colour.